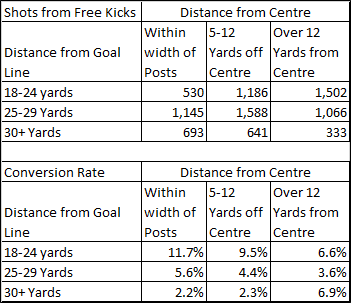 Last February I presented at the Opta Forum on efficacy of crossing/shooting from Free Kicks, I've been planning to do an update at some point but Gylfi Sigurdsson's free kick vs. Villa was a good reminder to pull my finger out and get on with it. When they go in like that one they make the defensive side look helpless and a goal 'unstoppable' - Guzan's positioning makes him irrelevant if the ball goes successfully over the wall. As great a free kick as it is, it's nowhere near the top corner when it goes in as it doesn't need to be that accurate to be a goal. The question is, as a keeper, do you 'trust' your wall and leave it to whether the free kick taker get the ball over the wall, or do you try and second guess the taker and risk leaving a massive gap for them. 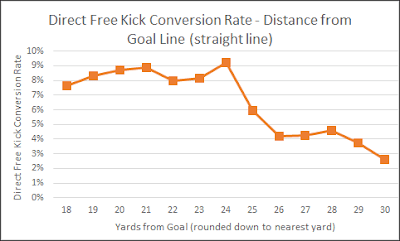 Sigurdsson and Eriksen are arguably two of the best free kick takers in the league but sample sizes are generally too small to get a true conversion rate for an individual, but we do have enough data to start to make some assumptions is general. 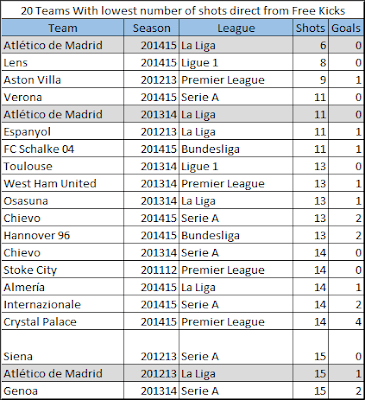 I don't have the same quality of data as provided by Opta for my forum presentation (so any errors will be mine rather than Opta data issues) but I have put together an analysis of the outcomes of over 9,000 direct shots from free kicks taken in the big 5 Euro leagues (last 5 full seasons for Premier League, last 3 full seasons for La Liga/Serie A/Bundesliga/Ligue 1). The other point to make is the relatively high conversion (6.9%) for long distance wide of goal attempts, my guess is that a lot of these are from free kicks that are 'put in the mixer' and end up going straight in. It's open play rather than a free kick, but this goal from Andros Townsend is a good example of an effort that probably wouldn't have been classed as a shot until it ended up going in. Going back to the Nice B example, if you know on average someone will score from a certain position 10% of the time, then if their unusual defensive set up resulted in a lower conversion then obviously that'd be a better strategy. The risk however is that even if you tested it in training over a large sample and were confident conversion dropped to 5%, if you did it in a Premier League match and it didn't work, you'd risk looking a fool (where you never look stupid if you do what everybody else does, regardless of if it's the best option or not). One of the other areas I covered in the Opta Forum presentation was how different teams approached free kicks in attacking areas, some shot pretty much whenever possible and some only shot in the prime positions. 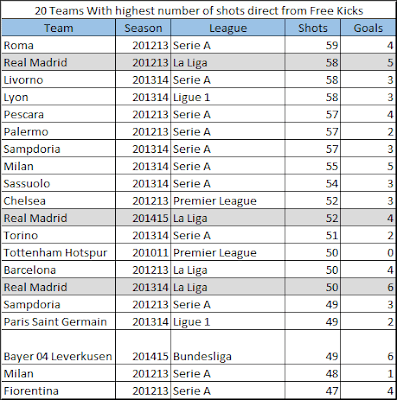 Looking at the highest/lowest free kick shot volumes, tho two Madrid teams come out at opposite ends of the spectrum, I would expect Real to have more possession than Atletico in general but there's no doubt that Atletico are passing up the lower chance shots in favour of crossing rather than shooting. 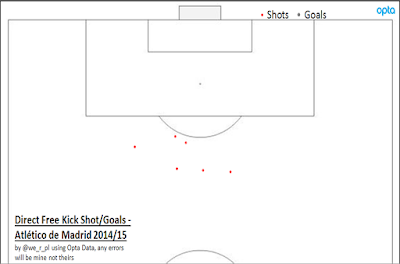 Atletico with just 6 direct shots in La Liga last season, down from 11 the year before and 15 in 2012/13. Lens' shot volume will in part be due to them finishing bottom in Ligue 1 last season. 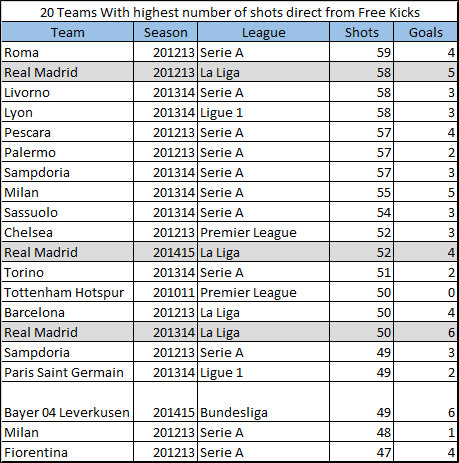 How much above average the likes of Sigurdsson and Eriksen are when it comes to free kicks is hard to quantify but feels like they take the art of free kick taking to a different level and that in some cases having a standard wall helps rather than hinders them.